History: (Ghost Rider III#8 (fb) - BTS) - The H.E.A.R.T. organization became highly recommended despite their high fees due to their impressive track record. Due to this record, H.E.A.R.T. was contacted by the Cypress Hills Community Action Group in hopes of eliminating a recent problem to their neighborhood: Ghost Rider. (Ghost Rider III#10 (fb) - BTS) - H.E.A.R.T. had also been contacted by Deathwatch to kill Ghost Rider. (Ghost Rider III#8) - Tyler Meagher met with the Cypress Hills Community Action Group to discuss the matter of Ghost Rider, whom the Action Group suspected of kidnapping neighborhood children. When Mr. Crane of the Action Group asked when H.E.A.R.T. could start if the Action Group decided to hire H.E.A.R.T., Meagher replied that they could start that night and warned that H.E.A.R.T. would not tolerate interference from the Action Group itself. Harry Stein then spoke up, warning the other members of the Community Action Group that they couldn't just give H.E.A.R.T. the freedom to go through their neighborhoods carrying such firepower but Meagher reminded Stein that the Action Group had contacted H.E.A.R.T. themselves and that H.E.A.R.T. 's terms were non-negotiable. Another Action Group member, the mother of Pauline Stratton, soon spoke up, hysterically asking why Harry was arguing over money when they should have been thinking of the neighborhood children. After the mother expressed hope that H.E.A.R.T. could find her daughter, Meagher announced that she would leave the choice up to the Action Group whether or not to utilize H.E.A.R.T. Tyler Meagher then returned to her van outside, where other H.E.A.R.T. members were waiting and informed them to contact all available H.E.A.R.T. units to tell them that they started that night by locating Ghost Rider. Later, at midnight, Tyler Meagher gathered together the other members H.E.A.R.T. and had them sound off before explaining that they would be going on a recon mission to observe what Ghost Rider was capable of. Following the gathering of video footage of Ghost Rider's battle with Blackout, Tyler Meagher viewed the footage. When asked how H.E.A.R.T. would proceed against Ghost Rider, Tyler replied that they would kill him. (Ghost Rider III#9) - From H.E.A.R.T. headquarters, Tyler Meagher contacted the other members of H.E.A.R.T. via commlink to inform them that their helmet cameras were functionally optimally and that motion sensors were located three combatants in Sector 12 (Cypress Hills Cemetary). She halted her own commands when heat sensors began picking up activity in Sector 10 (beneath the Cemetary). Meagher then quickly ordered the H.E.A.R.T. field agents to lock and load with full ammo clips, warning them to be ready to engage the combatants. The heat sensors went into overload when Danny Ketch transformed into Ghost Rider, prompting Tyler Meagher to order H.E.A.R.T. to move in and intercept everyone present. Upon seeing Ghost Rider on the helmet cameras, Meagher ordered H.E.A.R.T. to engage Ghost Rider to keep him from killing Blackout and the homeless man Blackout was attacking. Using special bullet jackets, H.E.A.R.T. managed to knock Ghost Rider into a nearby crypt. Shortly after investigating, H.E.A.R.T. found Ghost Rider gone, unaware that he had been snuck away by members of the mutant Morlock community. The H.E.A.R.T. field agents then reported back to Tyler Meagher about Ghost Rider's seeming disappearance. Meagher soon joined the H.E.A.R.T. field team in venturing in the nearby Morlock underground, where they found Ghost Rider battling Blackout. Meagher ordered H.E.A.R. T. to take down Ghost Rider quickly but X-Factor soon arrived on the scene as well. 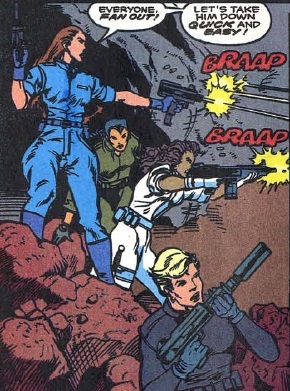 While Marvel Girl protected the children that the Morlocks were also attempting to protect, she asked that the other members of X-Factor disarm the H.E.A.R.T. members. Before X-Factor could do so, Meagher announced that X-Factor was not in their planned scenario and she ordered H.E.A.R.T. to retreat. Back above ground, Meagher commented that the Cypress Hills neighborhood children had been rescued by X-Factor and H.E.A.R.T. had managed to obtain Ghost Rider's motorcycle. Unfortunately for H.E.A.R.T., Ghost Rider soon summoned his motorcycle back to his side in order to escape the Morlock tunnels and the motorcycle rocketed itself from H.E.A.R.T. 's escaping helicopter and back underground. (Ghost Rider III#10) - At the H.E.A.R.T. headquarters, Tyler Meagher received a phone call and asked Luz Delgado to answer it. She then informed Luz that if it was the man who called earlier regarding H.E.A.R.T. 's services, H.E.A.R.T. would accept his offer. Luz then informed Deathwatch on the other line that H.E.A.R.T. accepted his offer and that the contract would be drawn up immediately. (Ghost Rider III#14 - BTS) - Deathwatch phoned Tyler Meagher and asked her to have H.E.A.R.T. ready to move at a moment's notice. He further explained that the bait had been set and that Ghost Rider would come to them. (Ghost Rider III#15 (fb) - BTS) - Tracking Ghost Rider until he disappeared from their radar (unaware that he had transformed back into Dan Ketch and crashed his motorcycle), Tyler Meagher ordered Luz Delgado and Denika Trevani to obtain all motorcycles within the area of Ghost Rider's disappearance. (Ghost Rider III#15) - When thugs tried to steal Dan Ketch's motorcycle, H.E.A.R.T. agents Luz Delgado and Denika Trevani arrived in the H.E.A.R.T. helicopter and demanded that the thugs back away from the motorcycle. Suspicious that the motorcycle they found might not belong to Ghost Rider, Luz commented that the bike didn't look like they had seen earlier in Cypress Hills Cemetary. Denika quickly reminded Denika of their orders and the H.E.A.R.T. agents pulled the motorcycle into their helicopter and took off. Later that night, Tyler Meagher spoke with Deathwatch, who commended her and her H.E.A.R.T. squad on obtaining Ghost Rider's motorcycle and suggested keeping H.E.A.R.T. on retainer. 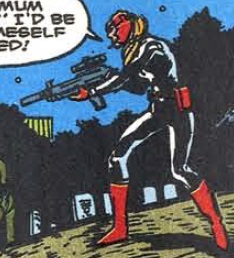 Meagher commented that she would like to personally finish the job by killing Ghost Rider in Central Park that night but Deathwatch warned H.E.A.R.T. to stay out of Park events. When Meagher asked why and learned that the murderous Blackout was also in Deathwatch's employee, she immediately ordered Denika and Luz to escape Deathwatch and kill anyone who tried to stop them. 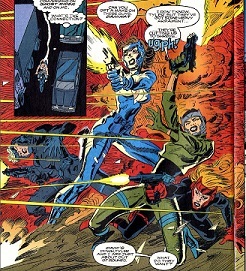 As Denika and Luz held up Deathwatch's men at gunpoint then escaped via their helicopter, Ghost Rider's motorcycle was once again summoned to Ghost Rider's side during Ghost Rider's battle with Blackout in Central Park. Soon after flying over Central Park, the two H.E.A.R.T. agents saw a flash in the park and prepared to set the helicopter down as Tyler Meagher confronted Ghost Rider personally. While Blackout escaped, Tyler held Ghost Rider down at gunpoint and ordered H.E.A.R.T. agents to her location for backup. When Ghost Rider caught up to Blackout and both Tyler Meagher and John Blaze followed, a standoff ensued as Blackout grabbed a hostage. While each contemplated their next move, Tyler blasted Blackout's arm, forcing him to briefly drop his hostage and buying Ghost Rider and Blaze time to stop Blackout. The police soon arrived and Tyler surrendered herself to them as they asked what had happened. (Ghost Rider III#33 (fb) - BTS) - Luz Delgado worked as security chief for the H.E.A.R.T. Corp. building during the group's rotation of the position. She also worked as field leader during an unspecified H.E.A.R.T. mission in which she lost her temper when she was supposed to do things by the book. (Ghost Rider III#33) - At the H.E.A.R.T. Corp. building, Tyler Meagher reprimanded Luz Delgado for losing her temper during her mission as field leader. Their conversation was interrupted by the building's motion sensors going off. Despite Tyler figuring that pigeons had set off the sensors, Luz agreed to investigate since she was the present security chief. Before she could do so, Luz was killed by an explosion from behind. Tyler immediately sent out a communication to the other H.E.A.R.T. agents that their headquarters had been compromised and that they were under attack. Regrouping with the other H.E.A.R.T. agents, Tyler asked if Denika was able to recognize their assailants. Denika commented that she did not know them but that they had some heavy artillery. Denika was killed almost immediately after her comment, prompting Fiona McCormick to ask what their attackers wanted. Shortly thereafter, Tyler was the only H.E.A.R.T. still alive when the Firm agents revealed themselves and announced that they did not want to kill Tyler's allies, only Ghost Rider. Her agents now dead, Tyler collapsed, wondering why the Firm wanted Ghost Rider. The Firm then quickly reported the neutralization of all H.E.A.R.T. agents excepting Tyler Meagher, whom the Firm agents reported would be taken into their custody. The Firm's head, Mr. Stern, commended the agents on their successful mission and commented about how perhaps the Firm could give Tyler a new life direction better suited to serve the Firm. (Ghost Rider III#37 (fb) - BTS) - The Firm surgically altered Tyler Meagher into their assassin Heart Attack, twisting her mind into believing that Ghost Rider had killed her H.E.A.R.T. teammates. Comments: Created by Howard Mackie, Javier Saltares and Mark Texeira. In Ghost Rider III#33, Tyler Meagher spoke to Denika Trevani but Denika's word balloon was erroneously placed above Mei Lin. Luz Delgado was the recon and electronics specialist for H.E.A.R.T. When the Cypress Hills Community Action Group discussed having H.E.A.R.T. remove Ghost Rider from their neighborhood, Luz accompanied the other members of H.E.A.R.T. on a recon mission to find out what Ghost Rider was capable of. She was later sent with the rest of the H.E.A.R.T. field team to engage Ghost Rider, who seemingly disappeared. Once Tyler Meagher helped track Ghost Rider underground, Luz accompanied H.E.A.R.T. in preparing for another attack on Ghost Rider before X-Factor arrived and forced H.E.A.R.T. to retreat. Shortly thereafter, Luz answered a phone call from Deathwatch on behalf of Tyler Meagher, who told Luz to inform Deathwatch that H.E.A.R.T. accepted his offer to kill Ghost Rider. Luz and Denika Trevani were later sent to track Ghost Rider and obtain his motorcycle. Upon doing so and turning the motorcycle over to Deathwatch, Tyler Meagher learned of Deathwatch's association with the murderous Blackout and ordered Luz and Denika to escape. As they escaped in the H.E.A.R.T. helicopter, they saw a flash in Central Park and prepared to touch down to aid Tyler against Ghost Rider. After losing her temper on a subsequent mission, Luz Delgado was reprimanded by Tyler Meagher before the H.E.A.R.T. Corp. building's motion sensors went off. Being the security chief that month as per H.E.A.R.T. 's rotating chief position, Luz prepared to investigate only to be blown up in the opening salvo of the Firm's attack on H.E.A.R.T. Mei Lin was the hand-to-hand and recon specialist for H.E.A.R.T. When the Cypress Hills Community Action Group discussed having H.E.A.R.T. remove Ghost Rider from their neighborhood, Mei Lin joined the other members of H.E.A.R.T. on a recon mission to find out what Ghost Rider was capable of. Mei Lin later joined H.E.A.R.T. in engaging Ghost Rider, who was pulled underground and Lin shortly after accompanied H.E.A.R.T. in tracking Ghost Rider into the Morlock tunnels, where H.E.A.R.T. was forced to retreat upon the arrival of the mutant superteam X-Factor. When H.E.A.R.T. 's headquarters came under attack by the Firm, Mei Lin regrouped with the other members of H.E.A.R.T. but was killed by the Firm agents. Fiona McCormick was the Irish demolitions specialist for H.E.A.R.T. When the Cypress Hills Community Action Group discussed having H.E.A.R.T. remove Ghost Rider from their neighborhood, Fiona joined the other members of H.E.A.R.T. on a recon mission to find out what Ghost Rider was capable of. After locating Ghost Rider, Fiona accompanied H.E.A.R.T. in attacking Ghost Rider, who was pulled underground. When H.E.A.R.T. 's headquarters came under attack by the Firm, Fiona McCormick regrouped with the other members of H.E.A.R.T., where she wondered what the Firm wanted. Before she received her answer, Fiona was killed by the Firm agents. Denika Trevani was the markswoman for H.E.A.R.T. When the Cypress Hills Community Action Group discussed having H.E.A.R.T. remove Ghost Rider from their neighborhood, Denika accompanied the other members of H.E.A.R.T. on a recon mission to find out what Ghost Rider was capable of. Denika eventually aided H.E.A.R.T. in attacking Ghost Rider, who was pulled underground by the Morlocks. After reporting H.E.A.R.T. 's failure to kill Ghost Rider to Tyler Meagher, Denika joined Tyler herself in venturing into the Morlock tunnels, where H.E.A.R.T. was forced to retreat when the mutant superteam X-Factor showed up. Denika was later sent with Luz Delgado to track Ghost Rider and obtain his motorcycle. Upon doing so, they turned the motorcycle over to Deathwatch, whom Tyler Meagher learned was working with the murderous Blackout. Ordered to escape and kill anyone who stood in their way, Denika and Luz boarded their helicopter and left to aid Tyler against Ghost Rider in Central Park. When H.E.A.R.T. 's headquarters came under attack by the Firm, Denika Trevani rushed to the side of her H.E.A.R.T. teammates. Despite not recognizing the Firm agents, Denika deduced the obvious about the Firm's heavy artillery and was killed almost immediately after her deduction.